At least 26 people have been killed after their vehicle hit a landmine in the south-western Pakistan province of Balochistan, officials say. Several people were also injured in the explosion in Dera Bugti, about 300 km (180 miles) from Quetta. Officials say the mine was planted by tribal rebels. The vehicle was carrying people to a wedding party. Gas-rich Balochistan has seen months of violence as tribal groups push for greater political and economic rights. Tribal separatists have attacked gas plants, electricity lines and railway tracks. The BBC's Zaffar Abbas in Islamabad says Friday's incident has led to the heaviest civilian casualties in a single incident, since armed clashes began between government forces and a militia led by a powerful tribal chief, Nawab Akbar Bugti. Officials said the vehicle was carrying a wedding party when it hit at least one anti-tank mine near the town of Rakhni, a local official said. The victims are said to belong to a clan opposed to Nawab Akbar Bugti. "Most of the dead are women and children. Seven people were injured," a spokesman for the Baluchistan provincial government, Raziq Bugti, told Reuters news agency. He said the number of casualties and the damage suggested that "there could have been more than one land mine but we have not confirmed that at this stage". Raziq Bugti said the landmine had been planted by rebels who have been fighting security forces in the region. There have been a spate of land mine attacks in the troubled province. 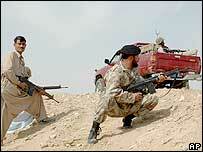 On Thursday, two landmine blasts in Dera Bugti killed a civilian and injured seven others. The elected administrator of Dera Bugti, Kazim Bugti, said recently that both tribal rebels and security forces planted landmines in the area. Government forces launched military operations in the Kohlu and Dera Bugti districts of Balochistan in December after rockets were fired near President Musharraf when he visited the province. According to local tribal leaders, a large number of civilians have died in the military operation, but this has not been confirmed by officials.